A Junk-Foodaholic's Journey to a Healthy Lifestyle: Kymm Hansen Lost 144 Pounds! What a beautiful lady. Kymm Hansen, a 37-year-old actress from Julian, California, went from 307 pounds to 164 pounds in 14 months! Kymm went from wearing a size 26 to a size 8! At home, the young Kymm shared a household with roommates who stocked their communal kitchen with high-calorie, fatty foods that became the ultimate temptation. Since she was left alone most of the day and forbidden to go outside due to an unfenced pool, Kymm found herself stealing their food, hiding candy wrappers between couch cushions while watching hours of TV. And so began Kymm’s long relationship with sneaking food. It didn’t help that the roommate, an adult mom, likened Kymm’s size to that of an elephant. “Having an adult say something like that, when others had already teased me about my size, confirmed in my mind that they must be right,” Kymm recalled. Kymm’s unhealthy eating habits and guilt followed her well into adulthood. Her weight, along with her self-esteem, fluctuated throughout her teens and 20s. When she finished high school and moved to New York City, she used her newfound freedom to eat even more, whenever she pleased. But the more she consumed, the more she damaged her already fragile self-image and her relationships. At 308 pounds, she was so ashamed of her body that she opted to spend much of her time isolated from her friends and family. Kymm admits she used food for “everything.” It became a source of comfort, a quick solution to boredom, and even a means of further torturing herself. She viewed food as a constant companion that would console her, until it ultimately made her feel worse. Personally attached to her favorite foods, Kymm didn’t know how to quit. Kymm’s situation escalated when she accepted a position as an instructional aide in her school district. Teachers' staff rooms were often filled with baked goods and homemade casseroles, and Kymm would eat the free treats in addition to the huge lunch she brought to work. To silence her guilt, she adopted a Scarlett O’Hara attitude. Kymm suffered both physically and emotionally from the burden of her weight. Apart from the daily obstacles (the heavy panting and achy back) she was in constant pain from the pressure weighing down on her left foot, which stiffened frequently while walking. Her orthopedic surgeon told her that if she failed to lose a substantial amount of weight, she could look forward to an invasive foot surgery. But the worst aspect for Kymm was emotional. She hated the feeling that she was wasting her life, that she neglected to fervently pursue her lifelong goal of becoming an actress. Determined to stop wasting precious time, Kymm enrolled in school to pursue a degree in theater arts. But despite her step forward, her problems followed. A year into the program, it dawned on her that she was relatively unknown in her class, primarily because she lacked the self-confidence and drive to give it her all. She had great grades, but few knew her name. And it could all be traced back to her weight, and how people treated her because of her appearance. Kymm called right away, drove to the center and immediately signed up. With encouragement from friends and family, she began working toward her goal. Once Kymm got into the rhythm of restricting her diet to healthy foods, she saw weight loss completely differently - as freeing. She met with her counselors privately three times a week to assess her daily intake and monitor her exercise routine, which she started out by alternating between one to two miles of walking almost every day. 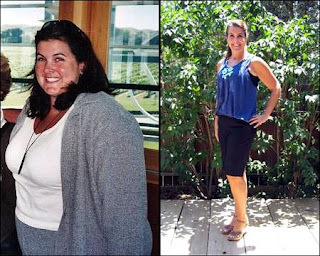 After just a few months, Kymm increased her regimen to walking in addition to working out on the elliptical machine every day – which helped her lose 50 pounds. The payoff was twofold: she felt better, and she was finally cast in her first leading role. She continued increasing and varying her exercise regime in conjunction with watching her diet, and the weight came off at “an amazingly quick rate.” With her mother’s motto of “everything you do is a choice," Kymm committed herself to planning out her meals in a food journal and checking them off each day. After 14 months, Kymm lost a total of 144 pounds and now weighs in at 164. In addition to her health, Kymm also credits more solid self-confidence to her new lifestyle. No longer is she ignored or passed over; she is now more willing to put herself out there and express her thoughts or opinions. People treat her differently, and she’s seen a vast improvement in both her friendships and family relationships. Kymm's mantra: "Change what you can, accept what you can't and while you're changing what you can, sometimes the things you thought couldn't change do." Check out Kymm's reveal on The Today Show here. What a great transformation/lifestyle change. KT - I agree. Kymm's story is inspiring. It always helps me to read about others making positive lifestyle changes.